During the first two weeks following the launch (November 2), the Redu Mission Operation Center brought the spacecraft in safe conditions and tested successfully the core spacecraft systems. On November 17 then, the SWAP electronics were first switched on and the housekeeping data checked. On November 20, the very first (dark) SWAP image was brought to the ground. At this stage the SWAP door, which can open only once and never reclose, was still firmly locked. Nevertheless, we took the occasion to take 602 dark images and 278 LED images. SWAP has indeed two LEDs (LEDA and LEDB) in the focal plane assembly which give a uniform illumination for instrument calibration. the spacecraft pointing was … poor. In the weeks afterward the pointing of the spacecraft was slowly but steadily improved 1, 2, 3 and … 4. The "star field" you see in the off-limb region are not stars or cosmic rays but bright pixels. The SWAP detector is an CMOS-APS and not a CCD. The essential difference is that for a CMOS-APS detector every pixel has its own read-out electronics and thus behaves slightly different from the neighboring pixels. Essentially we have 1 million individual pixels and a small fraction of it (<0.5% but still thousands of pixels) are not behaving. With onboard processing we can adequately process these images, even before they get to the ground (see also image on the left). By the time of the Christmas holidays we had collected 454 images after door opening, meanwhile SWAP kept on collecting dark images (the spacecraft was not sun-pointing) while the SWAP crew dispersed to the respective Christmas trees. During the week January 4-9, SWAP’s sister instrument LYRA also opened its doors. 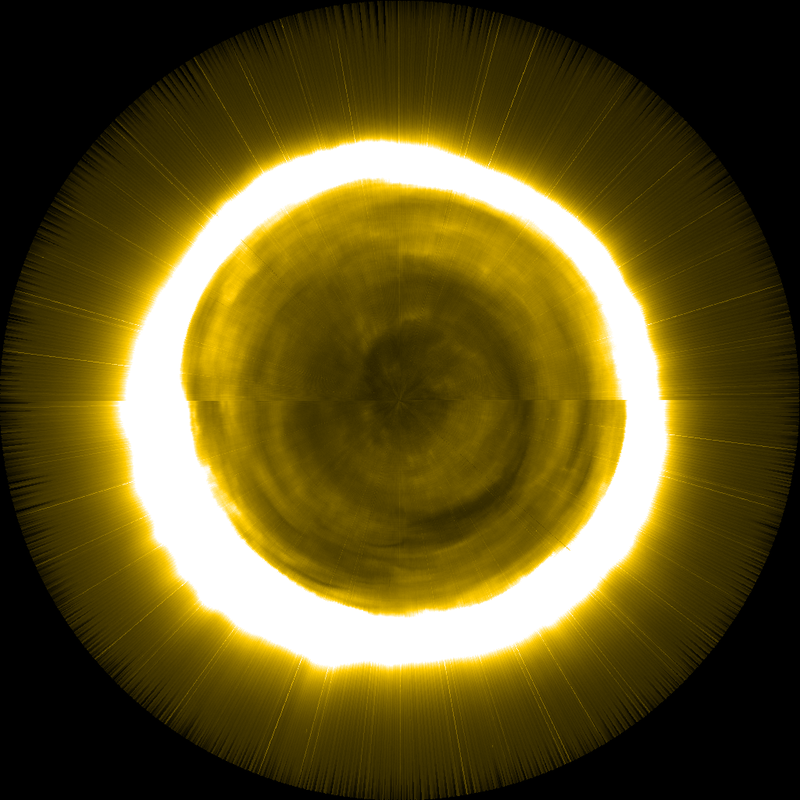 Besides solar physics, LYRA will also produce interesting data for aeronomy by looking through the Earth atmosphere and studying the spectral extinction, a trick that also SWAP can do. In the following week, SWAP secretly participated in SOHO JOP 225 and took solar images simultaneous with the EIT shutterless campaign. As PROBA2 flies on low Earth orbit, we pass 3 times per day (on consecutive orbits) through the South Atlantic Anomaly (SAA). As a consequence we see bright spots and stripes appearing in the images taken while passing the SAA. The spacecraft flies at a speed of (2 pi Earth radius)/ 99 min = 25 000 km/h, so, crossing the SAA is a matter of only a few minutes (see the difference between 1 and 2 taken only 6 minutes apart). On January 15, an annular solar eclipse happened above Asia. The successful prediction of the times that the Sun, the Moon, the Earth and PROBA2 were coaligned showed that orbit and ephemerides calculations (based on SPICE) are fully ready for the SWAP science mission. 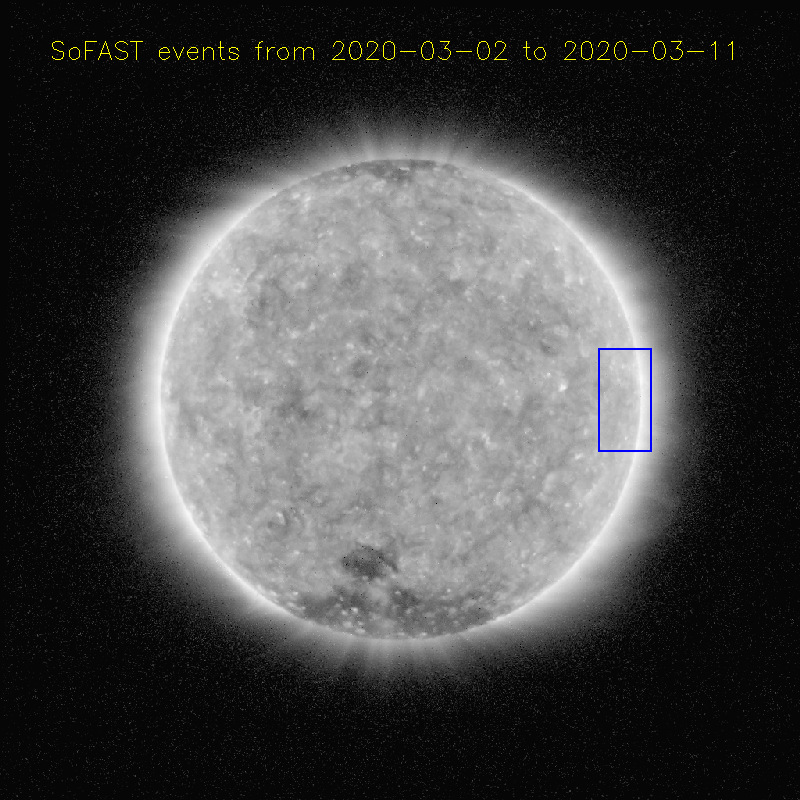 On January 19, SWAP observed the first M-flare of the new solar cycle (M2.3 at 13h41 UT, South East limb). An early version of a processed movie made it to the ESA website but as we get to know our instrument better, we are further improving the movie quality. 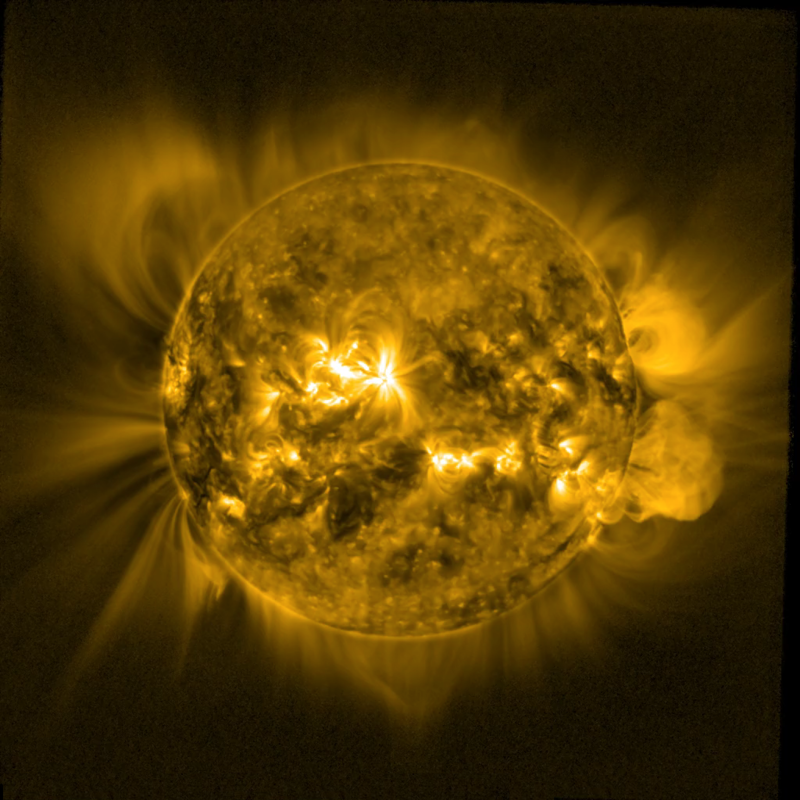 On January 26, 2010 (more than a month after acquiring the first solar images) we had our official "first light" press release. Besides the many journalists we were honoured to welcome Dr. D. Southwood and Dr. M. Courtois (ESA directors) and Mrs. S. Laruelle (Belgian Minister). The media response was enormous. Since the official press release, we can now publicly distribute the SWAP images. Quick look PNG images are online (in YYYY/MM/DD directories), as well as the beta-tests of the engineering FITS files and the base science data products. Note that all this is still subject to unannounced and frequent changes. We will probably need till the end of February 2010 before we will recommend/encourage scientific use of the SWAP data products. 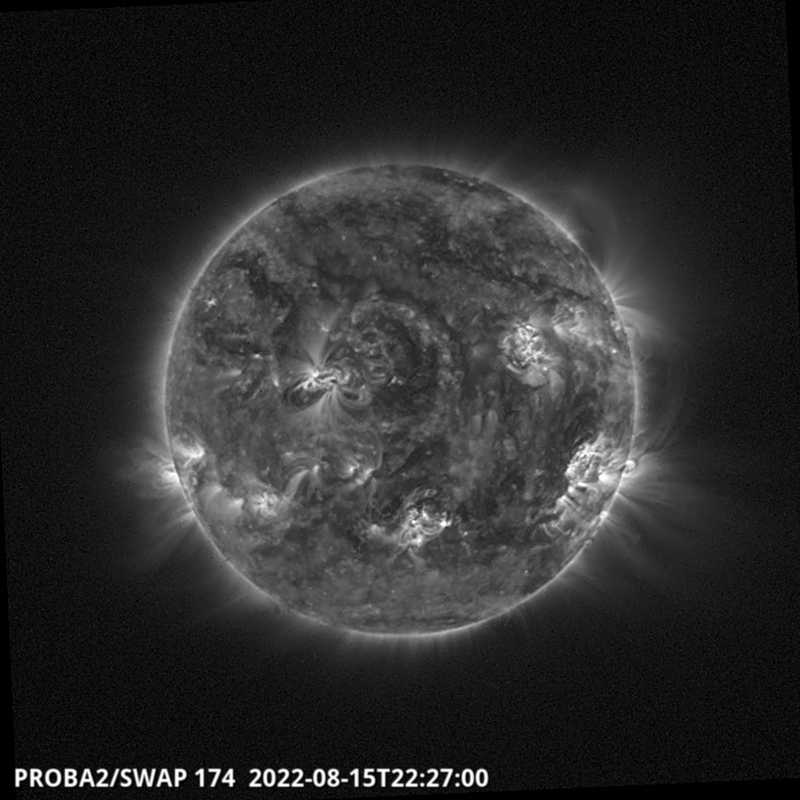 At the moment we are optimising the onboard parameters (integration time, compression, etc) for taking images. We are also collecting data to determine offset maps, dark current maps and a flat field map that will later be used in the SWAP calibration procedure. An interesting aspect of PROBA2 is that we can literally command its pointing right from our offices. Especially for constructing flat fields, it is a great help to be able to move the pointing, make the spacecraft roll or carefully sweep the Sun through the field of view to get a homogenous exposure. Please come back in a few weeks when we will be fully ready to deliver high quality SWAP images and movies!